In case you haven't gotten the memo, the cast of Stranger Things are one ridiculously talented bunch. While a decent portion of the cast are young actors on the cusp of stardom, the show also boasts a few very recognizable film and television actors. In short: not only is Stranger Things amazing, but the cast is, too. Don't fool yourself into thinking Winona Ryder is the only performer here with a ton of credits to her name. Quite the contrary, in fact. Both Matthew Modine and David Harbour have built careers as character actors and Millie Bobby Brown has spent a majority of her literal life acting. The Duffer Brothers may have made stars of Finn Wolfhard and Gaten Matarazzo, but these adorable young dudes has been acting and singing for years. Surprised? Don't worry, you're not alone. I may or may not (but definitely did) underestimate just how many roles some of the Stranger Things cast has had before their time on the monstrously popular Netflix show. So, now that we're waiting for Season 2 to drop, we'll need to find our fix somewhere, right? 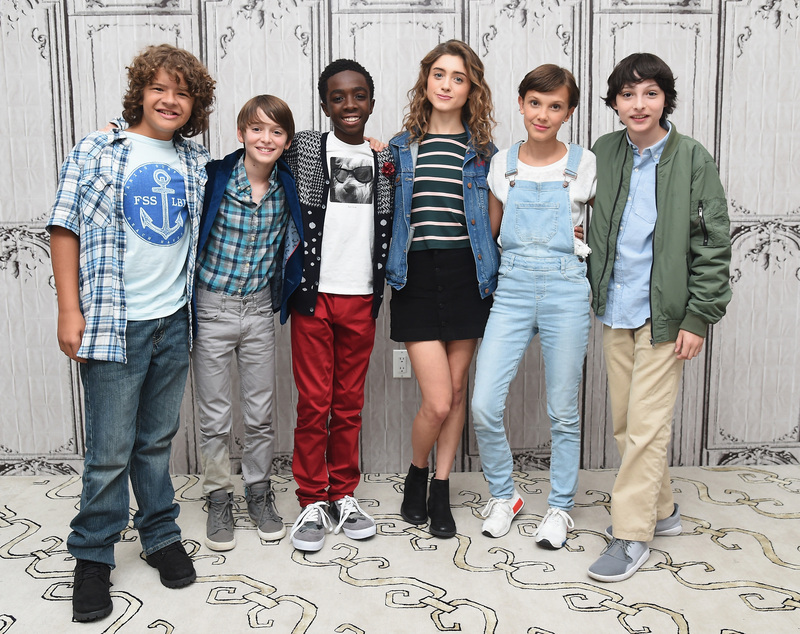 I'd recommend watching the stars of Stranger Things on the plethora of films and television shows that helped get them their Stranger Things gig. Here's a quick rundown of where else you can see them at work. Millie Bobby Brown has only had a handful of television roles previous to her star-making turn as Eleven on Stranger Things. If you haven't spotted her on Grey's Anatomy or Modern Family, then you might remember her from Once Upon A Time In Wonderland as the young Alice. If you're a fan of British sci-fi, then you probably know her best as Madison O'Donnell in 2014's Intruders. Check her out in the short character intro above and see why Brown was and always will be a true star. Before there was Mean Girls, there was Heathers. One of Winona Ryder's earliest but best-known roles to date was as the scheming, sardonic and brilliant Veronica. Best friends with a trio of popular girls who all happen to named Heather, Veronica plots to bring them down a peg with tortured bad boy J.D. (Christian Slater). Heathers is a near-perfect black comedy that you should definitely track down and watch immediately. Gaten Matarazzo has only one previous television credit to his name and that was on the crime drama The Blacklist. But if you are jonesin' for more Matarazzo, you need to watch him sing. Matarazzo is already a Broadway star, having had a short stint in Les Misérables. What can't this kid do? Natalia Dyer's breakout role was in the indie coming-of-age drama I Believe In Unicorns. As the shy teen Davina, Dyer is absolutely radiant playing a young woman discovering herself, understanding her own sexuality and exploring her creative impulses. Stream I Believe In Unicorns here. Charlie Heaton is another Stranger Things cast member set to become a star in his own right with an upcoming role opposite Naomi Watts and Jacob Tremblay in Shut In. Previous to Stranger Things, Heaton had roles in the indie drama As You Are, alongside Amandla Stenberg, and a guest role on the UK medical drama Casualty. Finn Wolfhard may have had small guest roles on shows like Supernatural & The 100 pre-Stranger Things, but he'll soon be taking center stage. Wolfhard is already locked in as one of the leads in the upcoming It remake, acting alongside Hemlock Grove's Bill Skarsgård & Midnight Special's Jaeden Lieberher. My guess is Wolfhard will have no trouble looking scared when facing off against a freakish clown after already fighting off a demagorgon. Cara Buono has been a mainstay supporting actress on television for more than twenty years. With long runs on The Sopranos, The Dead Zone and Person of Interest and shorter guest roles on The Good Wife, The Carrie Diaries and Law & Order, you've definitely seen Buono before. But she may be best known for her work on Mad Men as Faye Miller, a keen adwoman who frequently sparred (when she wasn't being romanced) with rakish Don Draper. David Harbour's most recognizable film role (aside from a recent blink-and-you-miss-it role in Suicide Squad) was as Shep Campbell, the meek, All-American neighbor of restless suburbanites Frank and April Wheeler (Leonardo Dicaprio & Kate Winslet) in Revolutionary Road. Harbour is the good guy here who gets drawn into Frank and April's personal drama easily and while his time onscreen is short-lived, it's a delight to watch. Matthew Modine starred in Stanley Kubrick's infamous film on young men fighting in the Vietnam War back in the '80s, beginning a career of roles that were intense character studies and brooding dudes. Modine has often been the go-to guy for quirky supporting roles, which might explain why he shines so brightly as the semi-evil Dr. Brenner in Stranger Things. Stream Full Metal Jacket here. A melodramatic but near-perfect portrait of post-grad ennui and struggle, Reality Bites is the Gen-X era film that everyone in their early 20's should watch ASAP. Winona Ryder once again delivers perfectly as budding documentarian Lelaina Pierce, a recent grad just trying to find stability in her career, friendship and romantic relationships. David Harbour's move between small film roles and larger television stints led him to rub shoulders with Jeff Daniels and Olivia Munn on Aaron Sorkin's hit HBO show, The Newsroom. As Elliot Hirsch, Harbour often got to spar with Daniel's Will McAvoy as they vied for lead anchor on the fictional television program, News Night. In the process, Harbour's star quality truly shone through. Joe Keery, a.k.a. the perfectly-coiffed Steve, has small roles on a variety of television shows before landing his Stranger Things gig, including Empire and Chicago Fire. He may have had small roles before, but Keery is destined to become a household name long after his time playing Steve. Before he was playing Will Byers, Noah Schnapp lent his voice to play another very put-upon youth: Charlie Brown. As the lead character of one of the most adorable films of 2015 & the lead of a hit 2016 television show, Schnapp has certified himself as a true breakout star. Stream The Peanuts Movie here. Anyone down for a binge-watching party? I'll bring the popcorn.